Unzip .zip file and inside Roblox Studio right-click on Workspace and click on ‘Insert from file…’ and select the unzipped .rbxmx file. On the GameAnalytics Roblox module page click on the ‘Get’ button. Inside Roblox Studio, select Workspace, open the Toolbox and select My Models and click on the GameAnalytics module to add it to Workspace. 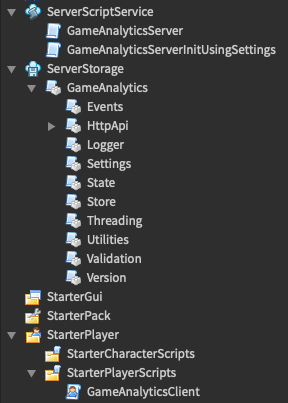 When the server starts the GameAnalyticsServerInitUsingSettings script will initialize the SDK. If AutomaticSendBusinessEvents is set to true (true by default), then when the server starts the GameAnalyticsServer script will subscribe to game:GetService("MarketplaceService").PromptGamePassPurchaseFinished to send these automatic business events. Also you should call GameAnalytics:ProcessReceiptCallback(Info) within your own game:GetService("MarketplaceService").ProcessReceipt method. Error events are used to track custom errors in the game code. You can group the events by severity level and attach a message. message = Something went bad in some of the smelly code!" Info and verbose logging will be automatically set from the EnableInfoLog and EnableVerboseLog values in the GameAnalytics.Settings script when the server starts, but can of course always be set on and off during the game at any time. Events submitted should register after a minor delay in our realtime dashboard in the GameAnalytics tool. Please note that when testing inside Roblox Studio event are only sent using the sandbox API not the live API. Generate new session when a user enters the game. Add a session start event (a “user” event) for that user. When a user exits the add a session_end event for that user. Whenever an event is added (and validated) it will be added to a queue. Every 8 seconds the SDK will start a task for submitting queued events since last submit. This processing is done in a separate low-priority thread that will have minimum impact on performance.